Now exceeding $450M in online bookings! EzyRez Online is a live, real time web reservation system enabling your guests to search availability and book securely online via your web page. 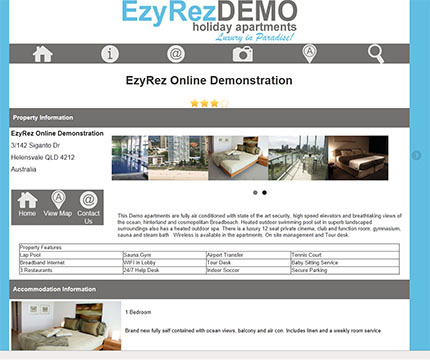 Bookings made from your web page automatically show up in EzyRez. That means no re keying of data. Rates and availability are seamlessly fed to your web page meaning you don't have to manage complex allotments or worry about double bookings. EzyRez Online has allowed our members to process close to half a billion dollars of online bookings and is growing daily. Customisable to match your web site design. Fluid layout suits mobile, tablet, desktop and smart TV. Finger friendly, tap to call, maps and nav. Absolute live last room availability with no manual allotting and no double bookings. Dynamic availability and rates grid, with hover for additional information. Detailed rates structures including cross season calculation, and weekend surcharge. Guests can view images of all room types as well as additional images. Room type hover for additional information and bedding configuration. Launch directly to a quote from your web page. Can be launched directly from 3rd party sites. Embedded Google Ad Words Tracking. Guests must accept your booking terms and conditions prior to booking. Your choice of confirmed bookings or reservation requests. Enquiry facility for guests not ready to book. Comprehensive extras for increasing your add on revenue. Can be linked to TicketMates/Experience Oz for even more add on revenue. Detailed booking rules to keep you in full control. Give your agents a secure login and booking facility. A return guest flag helps you identify your repeat business. Option to separate out multiple buildings or stages to separate booking engines, powered by one database. Optional rate parity linked to all of your last minute sites.